E-Filing of Tax Returns for year 2013-14 was officially closed yesterday after the 5 day extension was over on 5th August. As we mentioned earlier, e-filing of tax returns has been a big hit this year with nearly 50 percent increase in the people filing their tax returns online. 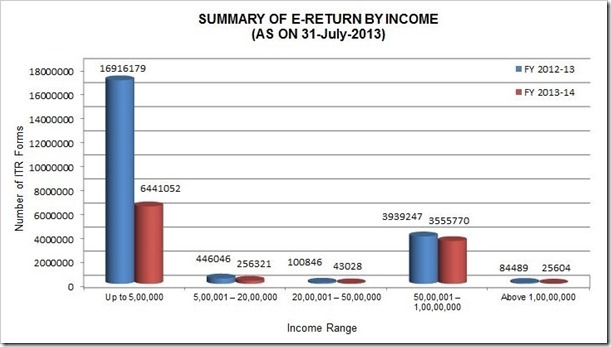 According to IT Department website over 1 crore (1,03,21,775) returns were filed online for year 2013-14. 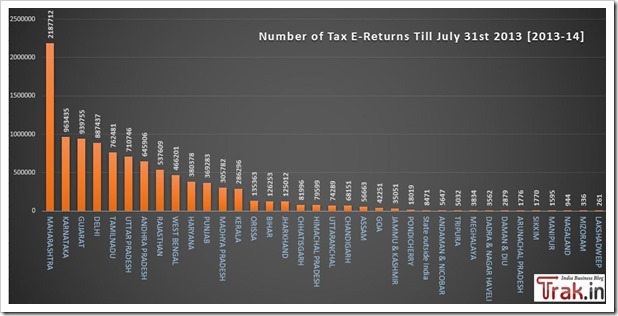 Though the number of e-filing is increased, it is quite interesting to review the larger picture. In a country which has a population of more than 124 crores, less than 1 percent citizens have actually filed their returns. Even among the people who have filed majority of them have filed in the income category below Rs. 5 Lakh, which attract nearly zero income taxes. Maharashtra leads in the number of IT returns returns filed their residents, that too by a very large margin. They have filed more than twice the number of returns as compared to second placed Karnataka. State of Gujarat comes in third with marginally lesser returns filed by their citizens. 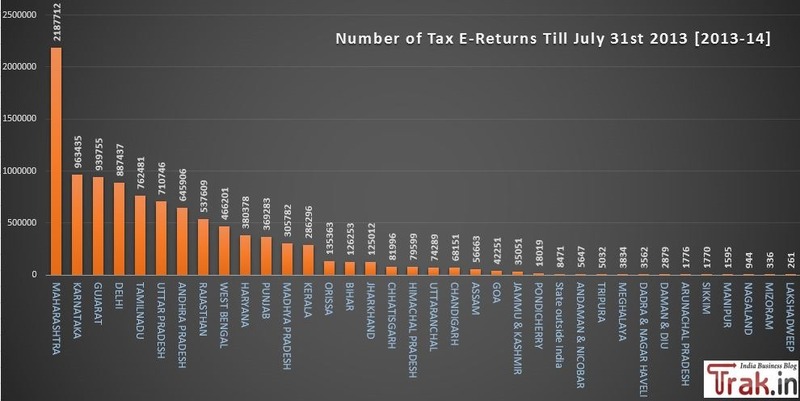 On the opposite end, 11 states in India have filed less than 10,000 e-returns each with 3 states of Nagaland, Mizoram and Lakshadweep filing less than 1000 in numbers. Here is the break-up. I think there is a mix up in the e-filing data chart. The greater than 50 lacs bucket has been exchanged with greater than 5 lacs bucket. Thanks! As a tax attorney in the United States I found your post very interesting and fascinating. Less than 1% have filed there returns is truly amazing. By the way what is 1 crore equal to in the US?